Mod: Today's post comes to us courtesy of the noted real estate blog Curbed LA. This truly is a nice house and all, and that $1.5 million dollar price tag is very Sierra Madre these days. One more sign that preserving the community and not allowing stupid DSP-style development in is making some residents a boatload of cash. But, and as you will see from the comparison pictures I've posted below, don't those interior shots look an awful lot like the now butchered Henry A. Darling house? 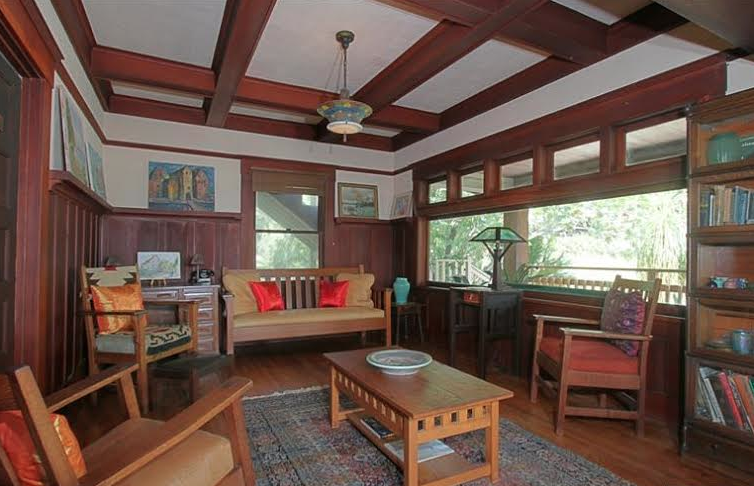 Sierra Madre Craftsman bungalow with pleasant yard seeks $1.5M (Curbed link): This sweet Craftsman in Sierra Madre is just lovely. 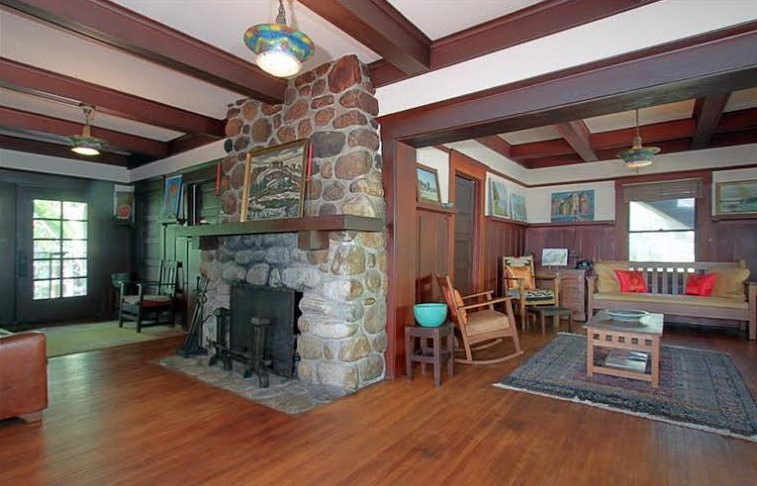 The house, built in 1921, is clad in redwood exterior siding and has an oversized front door. 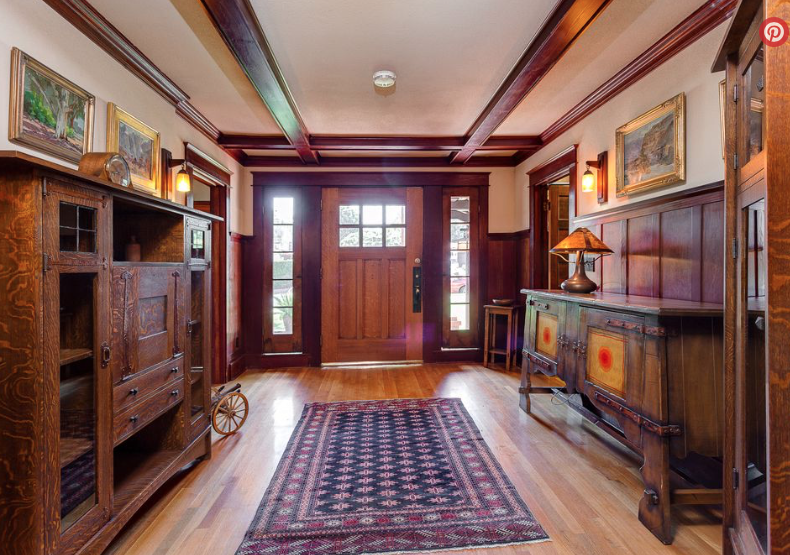 And, inside, there is a lot more glorious wood: white oak floors, wainscoting of mahogany, fir and redwood. 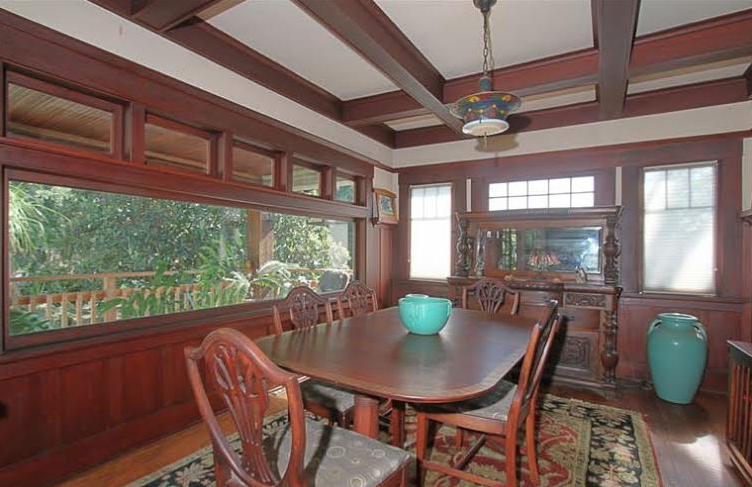 French doors and casement windows abound. The house’s three bedrooms are spacious and bright, and the bathrooms all feature vintage-looking tilework. 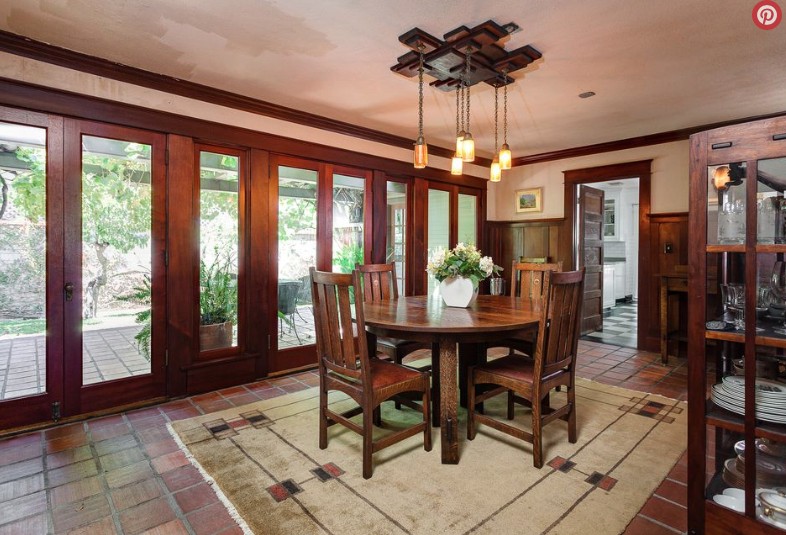 Saltillo tiles cover the floor of the dining room, which over looks the spacious rear yard. The house sits on a nearly 11,000-square-foot lot that includes a spa and views of the San Gabriel Mountains nearby. The house in the foothills last sold in 1979 for $97,500. It’s now listed for $1.499M. Mod: Here are some interior shots from what once was the Henry A. Darling house. Mod: I guess it now depends on whose hands these houses fall into. Avid Hiker, Walker Reported Missing in Sierra Madre (KTLA link): Police are asking the public’s help in their search for a man who disappeared from Sierra Madre two days ago. Carl Foote was last seen about 10 a.m. Sunday in the 100 block of East Laurel Avenue, according to a news release from the Sierra Madre Police Dept. 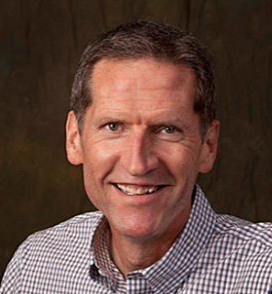 Foote was described as an avid hiker and walker. He stands 6 feet 9 inches tall and weighs about 200 pounds with hazel eyes. Foote has brown hair with a gray patch behind his right ear. He was possibly wearing a white t-shirt, khaki shorts, socks and tennis shoes. Anyone with information was asked to call the Police Department at 626-355-1414. The home is truly stunning and well worth the asking price. What great woodwork....and no one painted over it. It does look like the inside of the now ruined house! Any house that old and well maintained is meant to be kept and appreciated. The best thing about Sierra Madre is that it does not look like the generic thing the Downtown Investment Club members wanted to make their money on. Yes, it's true, a owner can reproduce the inside of their house. Also true, the inside of a house is not protected under California building codes. A penny wise, a pound foolish. The guy that bought the Darling House was not all that smart when it came to reclaiming materials inside the house. Could be the new owners may want an ultra modern look inside, or he was surrounded by demo expert's not restoration contractors. Either way, its his house. The Pleasant yard bungalow is priced a bit high, price should come down. That jerk can do whatever he wants, obviously. 7:33 - as long as the property owners here are protected against invasive predatory development their interests will be preserved. What you advocate is the exploitation of property owners. In many cases your own neighbors. Is that what the helicopter is doing on the hillsides? It's hovering over the area that was recently on fire. Helicopter has been circling Grove ,Lima, and east for past 30 minutes. Hope they have found missing person, not just a bear swimming in the neighborhood pool. Update, contacted S.M.P.D., Helicopter is from Sheriff's Dept. doing routine work. No new information on missing man. Are they actually looking for him? Is Foote from Sierra Madre or Arcadia? Arcadia Hiker Planning to Explore Mount Wilson Goes Missing - Carl Foote is an avid hiker who was planning to hike the base of Mount Wilson's trail, according to his family. Carl Foote is a local Sierra Madrean and talented photographer. I hope that he will be safely found. God speed. "COLTS NECK, NJ - Much has been made about Donald Trump's failure to release his tax returns, but our President has certainly bragged about paying as little in taxes as possible. Well, one of the ways he does that is by maintaining a small herd of goats on his golf courses in Colts Neck and Bedminster. According to this Wall Street Journal article, Trump keeps a small herd of goats on his Trump National course in Colts Neck. That herd, combined with hay farming and wood cutting done on the property, allows him to qualify for a special New Jersey farmland tax break, saving him tens of thousands of dollars a year in property taxes. While it is not known exactly how much Trump pays or saves (because he declined to release his tax returns), theJournal estimated the tax break could mean he pays less than $1,000 on land that would otherwise be taxed at $80,000 a year. There are cameras at Bailey Canyon entrance. Hope the Police are checking that film footage to see if Mr. Foote is viewed entering Bailey Canyon. Are there cameras at the Mt. Wilson Trail hiking entrance near Mira Monte/ Turtle Park ? If so, the Police should look there also. 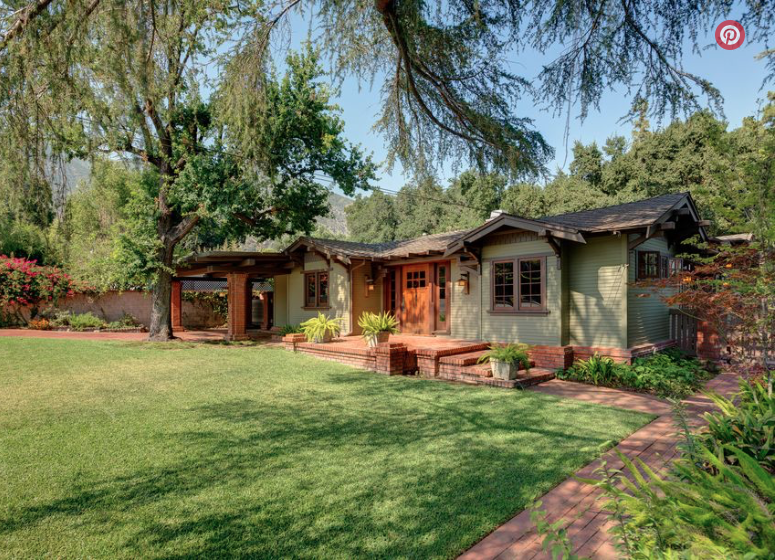 Wasn't this at one time a pretty nondescript bungalow purchased by a fellow who created a substantial business from reproducing craftsman-like furniture down on Montecito? Followed that by an enterprise located in Monrovia? Much renovation; much, much money poured into this property all supported by superb craftsman taste in fittings and furniture. I'm pretty sure that's the one. A testament not so much to "well maintained" but to careful construction and renovation. And, of course, a boatload of money. Not sure the asking price actually covers the amount invested over the 30-40 year facelift. Do you remember the gentleman's name, or the name of his business? 10:53am. President Trump is a environmentalist. He is using goats to keep the grasses short and fertilized. Wood chipping is a great way to mulch. Bloggers like you just are not imaginary or supportive of the environment. Canadian geese also eat grass, and are far more prodigious fertilizer producers. This could get some work for Canyon dwellers as well. They smoke grass, plus produce incredible amounts of fertilizer through their conversation. Washington is abuzz with reports that Hope Hicks, the 28-year-old White House Director of Strategic Communications—who, like most of Trump’s hires and appointments, had zero political experience—is Trump’s girlfriend. She has the highest salary of any of Trump’s aides—$179,700—and Trump paid for her apartment during the campaign. Hicks was a former model who worked in public relations until 2012, when she started helping Ivanka Trump expand her fashion line. She also modeled for Ivanka’s website, which is supposedly how Trump “discovered” her. She joined the Trump organization full-time in 2014. WASH POST:North Korea successfully produced a miniaturized nuclear warhead for it's missiles. Civil preparedness will be reinstated in schools along the West Coast of California, Oregon, Washington and Alaska. The President of The United States should be in the Situation Room on a day like this. Instead, he is tweeting about old grievances against the media and tweeting delusional assessments of his administration. Trump is suffering from serious mental incapacity. Why are the republicans who have the power to remove him sitting by and doing nothing to protect this country? Say what you want about Pence being a religious zealot and not all that smart, at least he is not insane. Do any of you remember that NK has lied about this stuff before? Obama played gold for thr entire eight years, still cant hit the greens! Played gold? What was wrong with silver? Perhaps trump is a better golfer than former President Obama but trump is a horrible,incompetent,corrupt President. Just last week you'll were whining about Russia and no nukes could reach Alaska. No wonder Obama didn't do anything. Trump's farting around with his 28 year old girlfriend and playing golf while the North Koreans are working on nuking the west coast. You think it's hot now? Sounds H O T !!! An affair between a 71 year old man and a 28 year old girl is hot? Usually the relationship between a 71 year old man and a 28 year old woman is patient and nurse. I'm terrified that as a last ditch effort to seem like he's doing something, Trump will start a war.